Still here in La Romana, the trendy, international hotspot for world polo matches and some of the best golf on the planet – this city grew out of the need for center of commerce for the surrounding sugar plantations. Gustavo Cisneros calls it his home away from home, and many of the jet set have homes along the sea. And why not? This area of Dominican Republic is growing at a rapid pace. Rock along with beautiful bays make for a heavenly setting. One area is specifically breathtaking. They couldn’t help that it just happens to be by one of the best beaches on the island, Bayahibe. These pristine beaches of Bayahibe are laid back and peaceful. True, many hotels have popped up along the coast, but Bayahibe is graced with tiny islands that host an ecological haven. Two main wildlife preserves, Catalina and Saona, are easily accessible from Bayahibe. Any hotel can help you with transportation. Some scientists still call the nearby Eastern National Park their temporary home as they continue to be thrilled by remnants of the ancient Taino civilization. 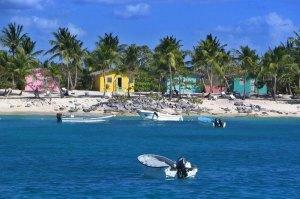 Here’s a tip: the beaches of Bayahibe are largely undeveloped and secluded. So if you love to get away from the crowd – this is your place. 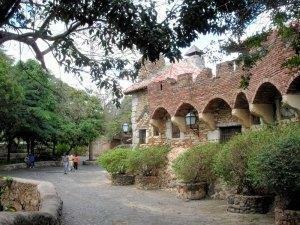 Just down the road from Bayahibe, stop at the Altos de Chavon. It’s a recreation of a 16th century Italian village, complete with artisan workshops, an archeological museum, cobblestone streets, and architecture to boot. Of course, you’ll just have to buy a piece of local work to take home! Be advised – it takes about a day to see everything. Begun in 1976 by Charles Bluhdorn, then chairman of Gulf + Western, Altos de Chavon is a flourishing Caribbean art center near the Chavon River and the sea. What a wonderful gift to the world. Sand – medium bright white powder/coral based. Facilities – at main beaches. Shade – umbrellas/huts at main beaches. Palm trees elsewhere. 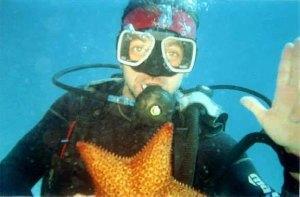 Sports – diving, snorkeling, windsurfing, hobie cat, banana-boat, more. Fishing – some of the biggest snook ever recorded were caught here. Golf – Golf magazine called Casa de Campo the finest golf resort in the world! Notes – can get crowded at holidays. Cruise ships use some beaches. Ask locals for best picks. 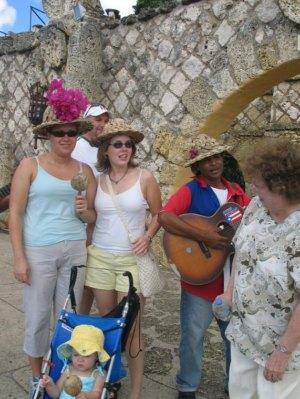 Don’t miss Altos de Chavon on your way out. Local art work is high class. T-shirts from the silk-screen workshops are among the most sophisticated in the Caribbean. – recommended.